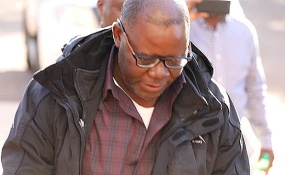 President Emmerson Mnangagwa's government should drop charges against former finance minister and opposition leader Tendai Biti to prove that the Harare administration is "serious about taking the country in a new, more positive direction". This was said by the United States' Deputy Assistant Secretary of State for Africa Matthew Harrington Thursday in a statement to the Senate Committee on foreign relations. Biti, who tried to seek political asylum in Zambia in the deadly aftermath of the July 30 elections, is facing charges of inviting the violence as well as illegally announcing the results of the hotly disputed vote. The MDC deputy national chairperson denies the charges. In his statement Thursday, Harrington said the Harare government "should immediately end the harassment of members of the political opposition". "It (government) should drop charges against former Finance Minister and prominent opposition figure Tendai Biti and all those who have been arbitrarily detained for exercising their human rights and fundamental freedoms," he said. Since taking over power through a military coup that deposed veteran leader Robert Mugabe last November, President Mnangagwa has sought to reengage the West after years of frayed relations under his predecessor. The shift in approach has been noted in Washington. "Since taking power last year and since his election, President Mnangagwa has regularly stated his commitment to pursuing political and economic reforms, as well as a better relationship with us. We welcome the change in rhetoric from the Mugabe years," said Harrington. "Since the (July 30) election, we have seen some promising signs from the government, including appointment of a new, more technocratic cabinet, announcement of an economic plan acknowledging the need for significant monetary and fiscal reform, and a budget which, if implemented, would make important strides in that direction." More however, still needs to be done. "So far, however, the pace and scale of reforms has been too gradual and not nearly ambitious enough," Harrington added. "A Zimbabwe that is more capable of providing for the needs of its own citizens and respecting human rights and fundamental freedoms will be a more responsible member of the international community. "To reach that end, Zimbabwe will require implementation of fundamental reforms- not merely a commitment to do so. That is a message we have shared consistently with Zimbabwean interlocutors, including President Mnangagwa and senior members of his government. "We want Zimbabwe to succeed and would welcome a better bilateral relationship, but the ball is squarely in the government's court to demonstrate it is irrevocably on a different trajectory." President Mnangagwa wants the US and other Western countries to drop sanctions his ruling Zanu PF party blames for Zimbabwe's decades-long economic crisis. The sanctions were imposed in reaction to "deeply flawed elections, serious human rights challenges, catastrophic economic mismanagement, and widespread corruption" under Mugabe.